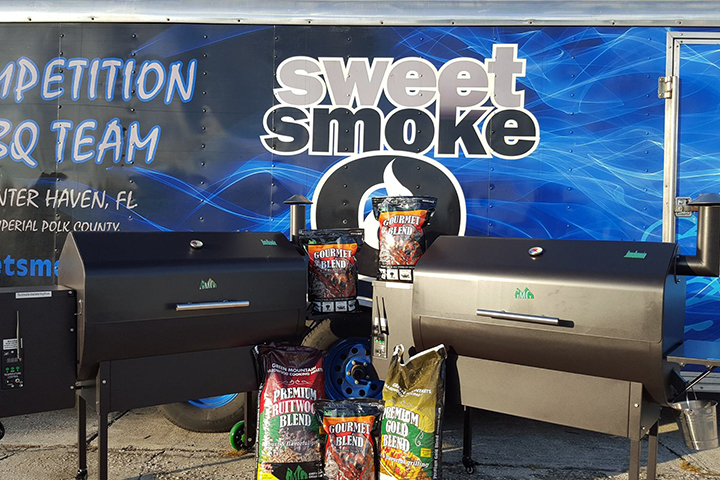 We Recently had a great talk with Jim Elser Pitmaster of Sweet Smoke Q and GMG user. Jim is a Winning machine and was named Florida Team of the Year. He also was recently featured and WON on the TV Show Smoked! Jim- Many things, it’s now is my full time job so itmeans a way to make a living. It also is something you do when you hang out with family and friends wither in the backyard or at a competition. BBQ brings people together. 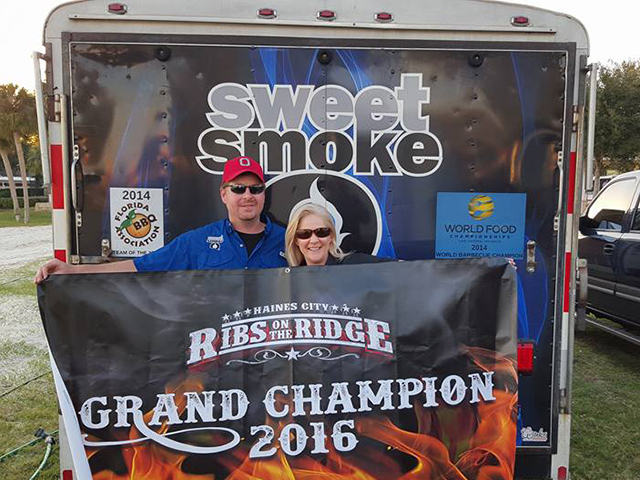 How did you get started in competition BBQ? Jim- Before I started competing in2010, I’d go visit the local Rib Cook Off in Toledo Ohio every year after I graduated college. I always wanted to compete there because I felt like I could cook better ribs than most of the teams did. Once I moved to Florida, I went to a few local BBQ events in the area and thought the same thing…I can cook better BBQ than this. One day bored at work, I came across the Florida BBQ Association’s website and found out there where quite a fewcontest in my area. I decided to retire my little red Brinkman smoker and build one that could handle some meat. I wanted a smoker that I could cook a lot of meat so I could compete and vend also. I designed and built a large stick burning smoker in two weeks. I fired it up for the first time a week before my first contests and made a few tweaks. My son, a buddy, and I rolled up like the Beverley Hillbillies to the Lakeland Pig Fest, one the largest KCBS contest in the south, ready to compete and vend. Long story short, I was ready to pack up at 5 pm Friday evening because we were but I didn’t because I had too much money invested in this BBQ adventure and I had scheduled another contest the week after…what was I thinking. Didn’t give up but really thought about it after my first 3 contests, now I looking back, I’m glad I didn’t. Where is your favorite place to eat BBQ? Jim- Who eats BBQ??? I don’t eat BBQ much these days but the place that comes to mind is S.L.A.P’s (Squeal Like A Pig) in Kansas City. I had some pretty damn good Q there. I do like the Carolina vinegar style bbq. What is the secret to good BBQ? Jim- Start off with good quality products, use the best quality meats you can afford. What is your go to BBQ item to cook on the GMG? Jim- Defiantly chicken for me, best chicken cooker out there. How many competitions do you cook a year? What was your biggest/favorite win? Jim- 30-35 a year the last 3 years. This year I may be pushing the 40 mark. 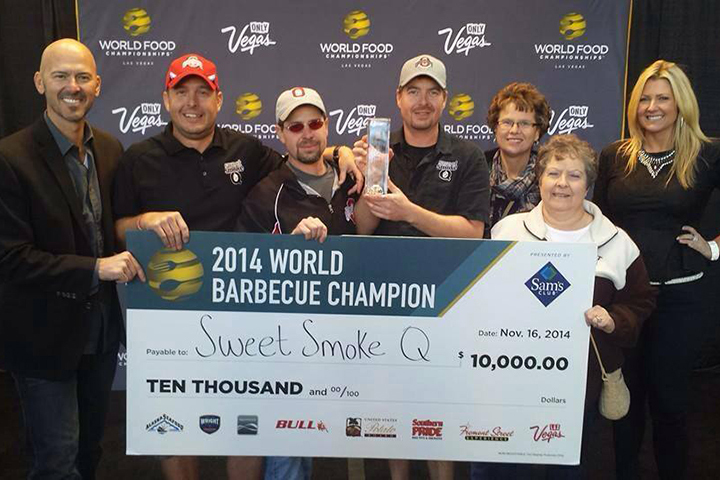 I think the biggest win was the 2014 World Food BBQ Championship. Favorite would is a toss-up between my first win at Venice, FL and this year’s Winter Haven’s Smoke on the Water. My hometown contest that took me 7 years to win. We recently saw you on Smoked, how was that experience? 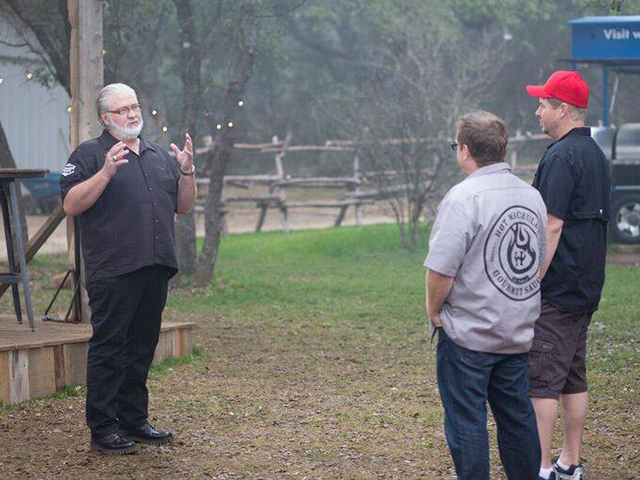 Jim – I was very honored to be asked to compete on Smoked. It was an experience I’ll probably never forget. It was a lot of work not just the filming but in the several months beforehand, interviews, paperwork, preparing, making travel arrangements, and more paperwork. It was more intense than I could have ever imagined and defiantly more tiring than a typical contest. We filmed for probably 20 plus hours over the 3 days we were there and it was interesting how the put the show together. I was watching the show with family and friends and I was on pins and needles even though I knew the outcome. It was a great experience no matter what the outcome was. You’ve cooked against myron before, how was tv myron vs competition myron? Jim-Myron is a great guy and have been cooking against him since my very first contest. I’m trying to figure out if there’s a difference, the only thing I can compare is that when there’s a camera on him he doesn’t like to lose and he’s hard to beat. He’s maybe is a little more focused when the cameras are rolling than when he’s a regular contest. What goals do you have for your BBQ future? Jim- For the competition side I’d like to win the Jack Daniel’s Invitational and the American Royal. As forthe business side, grow my product line to have multiple rubs, sauces, and get the Bird Q JUICE on the market. Any tips for new competitors? Jim- Learn and understand how your cooker cooks,there are different types of smokers and they all cook differently. You don’t need a $3000 smoker to make great BBQ. Keep your temperatures from fluctuating during your cook. And the most important thing is to be patient and don’t get discouraged. Never did I think after the first contest I’d have a business in BBQ,anything is possible with dedication and the passion.